Home security systems differ by installation method and monitoring method. For each method, you can go either the DIY or the professional route. To some degree, you can mix and match installation and monitoring methods. Depending on the company, you may get a professionally monitored system with either DIY or professional installation, but generally you’ll have to install your own equipment if you want to self-monitor. If you want to save money, both DIY installation and DIY monitoring are cheaper than their professional counterparts. Professional installation and monitoring, on the other hand, require less effort, and professional monitoring in particular is safer. When you consider what type of home security system to get, you’re primarily making two decisions: whether you want to install your own system or get it professionally installed, and whether you want to monitor your own system or have it professionally monitored. Keep in mind that what you decide will limit your security company choices. If you get professional installation, for example, you pretty much have to get professional monitoring. You’ll need to decide what your priorities are and look for home security companies that match your preferences. To make that process easier, we’ve broken down what you need to know about installation and monitoring options. Keep reading to find out what type of home security system is right for you. You’re primarily making two decisions: whether you want to install your own system or get it professionally installed, and whether you want to monitor your own system or have it professionally monitored. If you want to secure your home, you’ll start by installing equipment. This includes things like your control panel, cameras, glass sensors, and motion detectors. You have the choice to install this equipment yourself (DIY installation) or get it professionally installed. 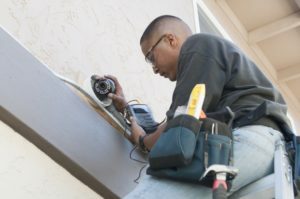 You may ask yourself, “Why wouldn’t I want a professional who knows what they’re doing to install my system?” At first glance, DIY installation often feels intimidating, and you might even worry it leads to a less secure home. Well, neither of those notions is exactly true. Most people choose DIY installation to save money. When you put in your own equipment, you don’t have to pay any installation fees, which is an easy way to lower the the cost of security systems. Plus, you don’t need to take a day off work to let someone into your home to drill holes and run wires through your walls. Fortunately, DIY installation is doable for most people. Most companies offer clear, thorough instructions on how to install your equipment. In some cases, it’s as simple as sticking self-adhering sensors to a wall. If you run into snags, you can always contact customer service for help. Like we mentioned earlier, many companies that offer DIY installation also offer professional monitoring. You certainly can choose a system that’s both DIY install and DIY monitoring, but the two are not synonymous. Now hold that thought—we’ll get back to monitoring options in a moment. In short, DIY installation can be a more affordable option. In short, DIY installation can be a more affordable option. You can simply and securely install your own system—just keep in mind that it will require more time and effort than a professional install. If you’re short on time or energy, getting a pro to do the work might be worth it. If DIY installation sounds too hard or time-consuming, professional installation might work better for you. Your alarm company of choice will supply the equipment and put it in, meaning you have more time to spend doing what you want. While you can safely and securely install your own equipment, you might rest easier knowing a trained professional did the work. Your security cameras and motion sensors will be where they should be and working well, so you won’t ever have to second-guess your own skills—a welcome respite for the less technologically savvy among us. Of course, professional installation may cost extra. Pro installation often comes with a installation fee of around $50–$100, though not always—several of the best systems with professional installation don’t have an installation fee. Even if you choose a system with an installation fee, the extra cost may be well worth the time and effort saved. If you decide to go with a professional installation, keep in mind that you’ll need professional monitoring as well. With a DIY install, you may have choices for both self- and professional monitoring, but pretty much all companies that offer professional installation require you to use professional monitoring. Of course, we strongly recommend professional monitoring, so we don’t think this should keep you from choosing a pro install. In short, professional installation costs a bit more than a DIY install, but it saves you time and energy. In short, professional installation costs a bit more than a DIY install, but it saves you time and energy. It also guarantees you’ll get professional expertise on everything from installation to monitoring. Once you have equipment, you’ll need monitoring to make your system effective. As with installation, you can choose between DIY and professional options. However, your monitoring choices will be limited by the company you get your equipment from. What kind of monitoring can I get? In virtually all cases, if you choose professional installation, you also have to choose professional monitoring. Some DIY install companies offer only professional monitoring, and others offer only self-monitoring—though companies like SimpliSafe offer both options. Let’s break down each option a bit more. With DIY home security, not only will you save on installation fees, but you can also save on monthly monitoring fees. However, those monetary savings come with a cost. Unmonitored security systems put the burden of security on you. It’s up to you and you alone to react to alerts from your system. Of course, that’s not always possible. What if you’re asleep when your alarm system sends an alert to your phone? 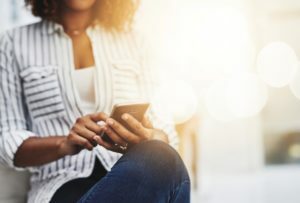 What if you’re in a meeting without your phone? What if you don’t have reception? Or, even worse, what do you do if an intruder is already in your home? How quickly can you respond and get help? These questions aren’t meant to scare you but to help you understand the very real downsides of self-monitoring. Even with these drawbacks, a self-monitored security system is better than no security system. If you want to save money and you understand the potential problems, DIY monitoring could work for you. If you’d prefer more security, think about choosing professional monitoring. With professional monitoring, you pay a monthly fee to ensure that someone responds in case of an emergency. That means that if your alarm goes off, your security company responds 24/7. If you choose a company that offers Crash and Smash protection, it will be alerted to an incident even if a burglar quickly destroys your control panel. The bottom line is that professional monitoring offers greater security. It does cost more than DIY monitoring, but you’re paying for a valuable, even life-saving service. Whether your motion detectors or smoke detectors go off, a monitoring company will have your back. Getting a home security system is one of the best safety measures you can take, regardless of what type of system you choose. Whether you choose DIY install and DIY monitoring, DIY install and pro monitoring, or pro install and pro monitoring, what matters is that you’re protecting your home and everyone in it. Ready to take the next steps to securing your home? Check out our rankings of the Top Home Security Systems.